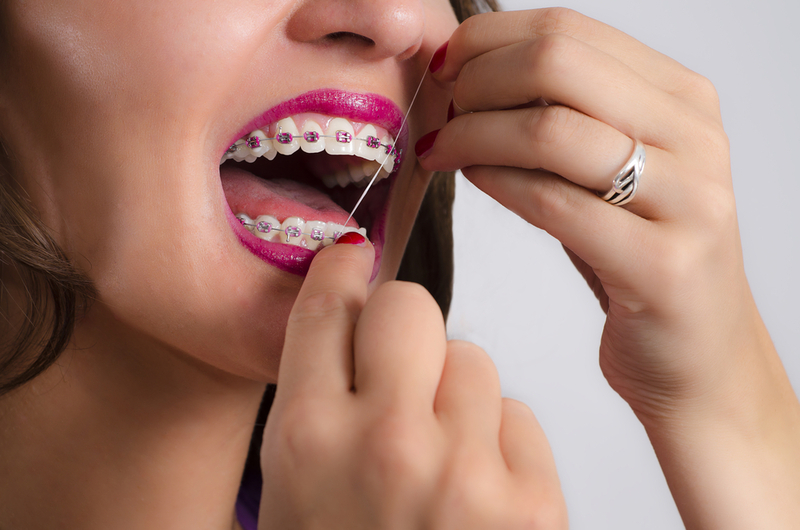 Flossing with braces isn’t as tricky as you might first assume. This essential skill is worth learning how to perform correctly. Floss reaches surfaces of your teeth that your toothbrush can’t. Your orthodontic appliance can trap food more easily than before. The need for flossing with braces is never more important than when you are undergoing orthodontic treatment! We will show you your options for flossing with braces when you receive them. If you ever feel challenged with the process, give our office a call! At Belmar Orthodontics, caring for your teeth is our top priority. A helpful tool called a floss threader can assist you with the more traditional flossing with braces method. Floss threaders help you place the floss behind your braces. A floss threader looks similar to a small plastic needle. Thread a piece of floss into the eye of the floss threader then move the plastic needle under the archwire of your braces and pull the floss through. After the floss is under the archwire you can floss your teeth like you normally would. When you are done with one tooth, remove the floss and repeat the process with the same floss threader. Floss picks are a popular product for many orthodontics patients. Floss picks hold the floss for you, making it extremely convenient since you only have to use one hand. While they may be convenient, they are not as effective as regular floss. Floss picks do not allow you to reach all the necessary angles that normal floss can. When you floss, you should strive to complete a “C” around the tooth and go up and down to completely clean the tooth. While regular floss is recommended, floss picks are better than not flossing at all if you find the traditional method isn’t working for you. Remember, the staff at Belmar Orthodontics is here to help you with flossing with braces so you are comfortable with the process. Water flosser (or “oral irrigator”) are another popular tool used to help with flossing with braces. Much like the name suggests, water flossers are flossing devices that use a stream of pulsating water to remove plaque and food particles from between your teeth. Water flossers not only remove plaque, but they also improve your gingival health. The machine has a water reservoir that connects to a device resembling a toothbrush. By adding mouthwash to the water in your water flosser you can also increase the antibacterial protection this tool offers you. Proxy brushes are small, flexible, pointed brushes that have bristles that look similar to a pine tree. Their unique shape makes them ideal for cleaning behind braces. To use a proxy brush, insert the brush under the wire and between the teeth, then scrub to clean. You can also use a bit of toothpaste on the proxy brush for a better cleaning. It is important to note that proxy brushes are NOT suggested as a replacement for flossing with braces. They should be used along with flossing to ensure that all the areas around your teeth stay clean. Pick a waxed floss. A lot of people prefer wax-coated floss because it slides in and out of your teeth more easily than unwaxed floss. Tear off a piece of floss that is about 12-18 inches in length. Gently thread the floss behind the archwire. Grab the ends of the floss in each hand. Wrap the floss ends around your fingers to secure your grip. Move your index finger inside your mouth gently moving the floss so that it cleans the spaces between your teeth. Move the floss up and down cleaning the sides of your teeth–the sides your toothbrush can’t clean. Complete a “C” around the tooth and go up and down to completely clean the tooth. Orthodontic treatment in young children (ages 6 or 7) is known as interceptive orthodontics. It is important to understand that children at this age don’t have the dexterity required to succeed with flossing. These children will need parental help with flossing their teeth. Since helping your child floss her teeth can take some time, it might be helpful to have your child sit, and possibly watch or listen to a favorite program/music while you floss. Don’t feel discouraged when you begin flossing your teeth for the first time with braces. Expect the process to take longer than the time it took you to floss your teeth previously. Even though flossing make take more time with braces, understand that flossing is essential when you are wearing orthodontic appliances to avoid tooth decay and problems that could delay your orthodontic treatment progress. Bleeding when you floss is NOT unusual after you have braces applied to your teeth. Teeth will experience some inflammation after your braces are placed. Swish with water before brushing. Rinsing with water after eating helps to loosen and dislodge food that may be caught in the braces. Brush your teeth before flossing. To help remove particles of food more easily from your braces and loosen the stuck particles. Use waxed floss. So it doesn’t catch on braces and leave behind shreds of floss. Floss at least once a day. Flossing helps loosen food debris and plaque at and under the gum line that would otherwise harden into tartar. It can also help reach the nooks and crannies in the teeth that are difficult to reach with a toothbrush. Use a fluoride rinse. After brushing and right before bed, use a fluoride rinse to help keep teeth strong and healthy. Schedule a dental visits every six months. Include your dentist in your orthodontic treatment process to ensure your teeth are staying strong and protected during your orthodontic treatment. Life with braces brings exciting changes, and sometimes some challenging adjustments too, but the end result is a healthier you! Belmar Orthodontics can help you obtain a healthy, functional, attractive smile. If you need help with flossing with braces, our online patient education can help answer any questions you may have, and our friendly staff is always available to help. Call 303.225.9016 today to learn more about braces or to schedule an appointment. Dr. Hardy is committed to your care and will help you reach your smile goals as quickly and efficiently as possible if you need braces.